Myra lives and works in North East Wales. Her work is exhibited extensively throughout Wales and the UK. Exploring themes relating to the human condition, the inner self, the hidden and unseen she works both in 2D and 3D, moving between the two, one informing and influencing the other. Materiality and repetition of action is at the heart of her practice; interrogating, manipulating and exploring materials that are metaphors for the body, where the body isn`t present but is implied. The materials bring with them connotations from former uses triggering associations embedded in our collective consciousness. In her current body of work, the ways in which we are bound and trapped by work, convention, society and our mental and physical health are explored. My work is. deliberately open, ambiguous, thought provoking and challenging; I hope the viewer will pause for a moment to consider,reflect and interpret the clues left within the work and offer their own interpretations.. 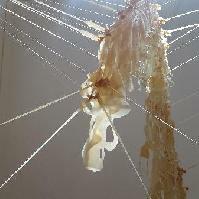 Some of the artists who have influenced my work are Eva Hesse, Louise Bourgeois, Mona Hatoum, and Susie MacMurray. My work can currently be viewed at the Royal Cambrian Academy, Conwy until February 10th. Awards: 2018, Highly Commended, Royal Cambrian Academy. 2016, Royal Academy Summer Show. Nominee European League of Institutes of Art, Amsterdam. 2015, Welsh Graduates of the Year 2015.